Whether you sing professionally or as part of a community choir, you need to take care of your voice. Your vocal cords are delicate and unique, and singing your best means treating them with respect. Here, we’ve put together ten top tips to help you maintain optimal vocal health. Quality Sleep. Lack of sleep is the enemy of the voice and singers must sleep well to sing well. Every night, our bodies require a certain amount of quality rest to recharge and restore. When your body is fatigued, your voice is too. Scrimping on sleep will result in a lack of clarity, loss of volume, diminishing tone quality and over time can cause damage and strain. A full eight hours of slumber the night before a vocal performance will support optimum voice quality. Good ventilation. Whatever you are breathing in from your environment affects your voice and throat. On one end of the scale, cigarette smoke and smoke machines will wage war on your vocal cords, but even something as seemingly harmless as a centrally heated room with low humidity can cause your voice to dehydrate and suffer as a consequence. Try putting bowls of water on the radiators, treat your lungs to plenty of fresh air and keep your environment well ventilated by opening windows. Keep well watered. Whether it’s tap or mineral, keeping your system well hydrated with eight glasses of still water a day is as healthy for your voice as it is for your body. If you’re not adequately hydrated the vocal folds can become irritated more quickly, leading to redness and swelling. Avoid ice though – that kind of cold is a nasty shock to the vocal cords and they’ll tighten up in an instant. Wear a scarf. Sudden changes in temperature can play havoc with your voice. If you’re going from the heat to an air-conditioned chill in summer, or from the cold into warm interiors in winter your voice will feel it. There’s a simple solution, wear a scarf, whether it’s a woolly one in winter or a silk one in spring, your voice will thank you. Warm-up. We need to stretch and relax the muscles before we sing, in just the same way as we would before physical exercise. It might be tempting to skip it, but without a warm-up your voice will be wispy and flat in no time. A gentle warm-up loosens the vocal muscles, removes excess mucous and reduces the risk of injury. Don’t go to the outer parameters of your voice though, some gentle exercises like humming will do the trick. No Shouting. Raising your voice suddenly will put a huge strain on your vocal cords if you haven’t warmed-up. Ok, sometimes you need to – kids run into roads and toddlers get too close to ovens – the key is being mindful. Healthy eating. A diet that promotes overall good health will also be great for your voice. Fresh fruit and vegetables contain a high water content and foods that hydrates you will help your vocal cords. Try to avoid anything claggy which create mucous like dairy and chocolate. Remedy drink. 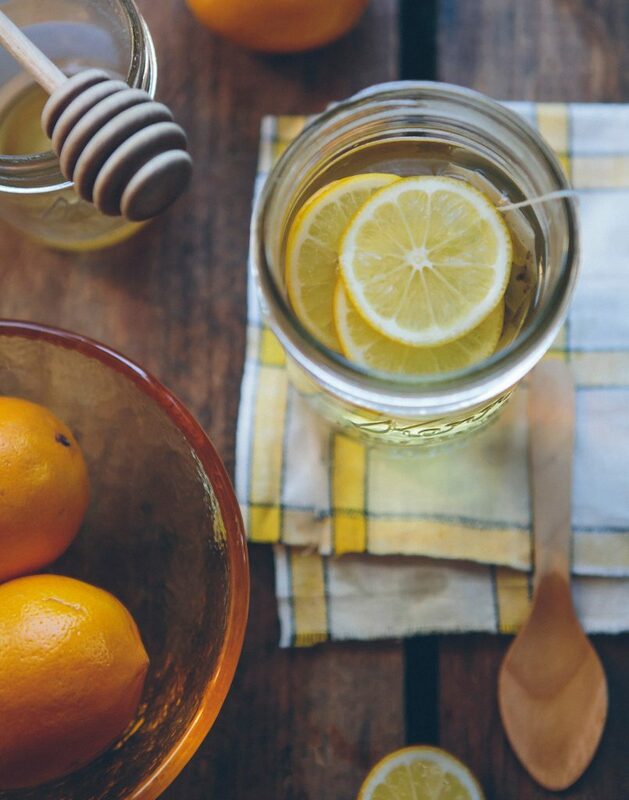 A mug full of hot water with lemon, ginger and honey is a superb natural tonic for the throat. The vitamin c in lemon cleanses and cuts through phlegm, the ginger reduces inflammation, and the honey soothes and lubricates the vocal cords. Sore throat care. Unless you have laryngitis, a tender throat or a common cold won’t necessarily mean no singing, but if your voice is hurting it needs more rest and hydration. Lozenges can help before a gig or rehearsal, but avoid the anaesthetic type that numbs, you need to be able to feel your throat or you could do more damage. Steaming. You might prefer to buy a fancy facial steamer but it’s easy to fashion a home made DIY version out of a bowl of hot water and a tea towel. However you do it, steaming is an effective and simple way to relieve a sore throat and loosen mucous in the nose, throat and lungs allowing you to sing more comfortably when the voice is struggling. A few drops of lavender and thyme will reduce a sore throat while eucalyptus is excellent for coughs and colds.